•1778—The Hawaiian Islands were originally settled by Polynesian immigrants more than 1,000 years ago, but remained unknown to Europeans until Captain James Cook landed there in 1778. •1800—During the late 1800s, Hawaii developed an export economy based on sugar and pineapple cultivation, drawing thousands of Asian immigrant workers to the farms. •1893—Hawaiian Queen Liliuokalani attempted to impose a new constitution claiming more authority for native Hawaiians, but white leaders occupied the government office in Honolulu and overthrew the monarchy. •1959—The first Asian-American in the United States Senate was Hawaii’s Hiram Fong. Descended from Chinese immigrants, Fong was elected to the Senate. •By a legislative act, Hawaii became officially known as the “Aloha State” in 1959. •1959—Hawaii was the 50th state admitted to the union on August 20th, 1959. •The state of Hawaii consists of eight main islands: Niihau, Kauai, Oahu, Maui, Molokai, Lanai, Kahoolawe, and the Big Island of Hawaii. •Hawaii has the most advanced telecommunications system in the world. The state is one of only five states in the U.S. with 100 percent digital switching for telephones and more fiber optic cable per mile, per capita than any other state. •Hawaii’s Iolani Palace is the only royal residence in the United States of America. 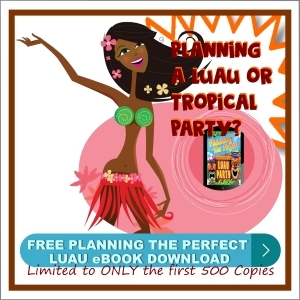 •During the Hawaiian Monarchy, Hawaii’s population was among the most literate in the world. •King Kalakaua was the first reigning monarch to circumnavigate the globe and the first foreign head of state to speak before a joint session of Congress. •Hawaii is the most isolated population center on the face of the Earth. Hawaii is 2,390 miles from California, 3,850 miles from Japan, 4,900 miles from China, and 5,280 miles from the Philippines. •Hawaii is considered the nation’s (USA) endangered species capitol. •More than one-third of the world’s commercial supply of pineapples comes from Hawaii. •Under-sea volcanoes that erupted thousands of years ago formed the islands of Hawaii. 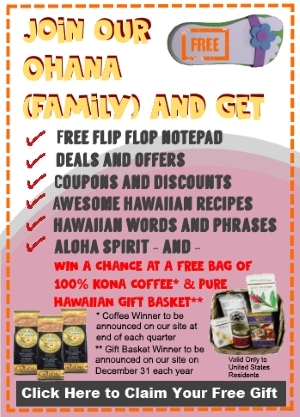 •Hawaii is the only state that grows coffee. •From East to West, Hawaii is the widest state in the United States. •The Hawaiian Islands are the projecting tops of the biggest mountain range in the world. •Honolulu’s zenith star (the star that rises directly above it) is Arcturus. The Hawaiians called it Hokule’a (Hoe-koo-lay-uh). •The Hawaiian Archipelago consists of over 130 scattered points of land stretching some 1,600 miles in length from the Kure Atoll in the North to the Island of Hawaii in the South. •Hawaii has its own time zone (Hawaiian Standard Time). There is no daylight savings time. The time runs two hours behind Pacific Standard Time and five hours behind Eastern Standard Time. 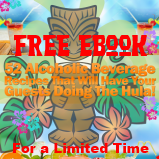 •There are four counties in Hawaii (Kauai, city and county of Honolulu, Maui, and Hawaii). Each city has a mayor and council in charge. •All subterranean minerals belong to the state. Except for state owned water, some lava stone, and minor granites and semi-precious minerals, there are few underground minerals. •The wind blows East to West in Hawaii. The highest recorded temperature is 96°F (Honolulu Airport), but temperatures over 92°F generally occur only once or twice a year. The lowest temperature (under 3,000 feet altitude) is 56°F. Temperatures under 60°F may occur, but rarely more than once a year. Average daytime temperature (July) is 82°F. Average daytime temperature in January is 72°F. •There are no racial or ethnic majorities in Hawaii. Everyone is a minority. Caucasians (Haoles) constitute about 34%, Japanese-American about 32%, Filipino-American about 16%, and Chinese-American about 5%. It is very difficult to determine racial identification as most of the population has some mixture of ethnicities. •A privately owned island, with livestock raising as its principal industry. There is highly limited access by general public through helicopter landings at uninhabited sites. Legend says Niihau was the original home of the goddess Pele. The island has a population of 230, and is 69 square miles. •The fourth largest of the Hawaiian Islands. •The Waialua River is one of five navigable river in Hawaii. It drains off Waialeale mountain, which averages 488 inches of rain per year, and is considered the wettest spot on earth. •Honolulu is the largest city in the world—at least it has the longest borders. According to the state constitution, any island (or islet) not named as belonging to a county belongs to Honolulu. This makes all islands within the Hawaiian Archipelago that stretch to Midway Island (1,500 miles northwest of Hawaii) part of Honolulu. Honolulu is about 1,500 miles long, or more distance than halfway across the 48 contiguous states. •Wai Golf Course is Hawaii’s first municipal course. •Honolulu is the nation’s 11th largest metropolitan area. •More than 100 world-renowned beaches ring Honolulu. •Iolani Palace is the only royal palace in the United States. •The world’s largest wind generator is on the island of Oahu. The windmill has two blades 400 feet long on the top of a tower twenty stories high. •The island of Oahu draws more visitors than any other to Hawaii. One-third of the state’s best surfing beaches are on Oahu. •The island is home to many famous attractions including Haleakala Crater, the old whaling town of Lahaina, the road to Hana, and Kaanapali Beach. •Haleakala Crater (Ha-lay-ah-ka-lah), is the world’s largest dormant volcano. •Molokai is known as the most Hawaiian isle. •Molokai’s east end is a tropical rain forest and part of the island receives 240 inches of rainfall a year. •Molokai Ranch Wildlife Park is home to rare African and Indian animals. •Kalaaupapa was once a leper colony administered by Father Damien. •The island contains the world’s highest sea cliffs, Hawaii’s longest waterfall, and the largest white sand beach in the state. •The island of Lanai is considered Hawaii’s most secluded island. •The island was once the home of the world’s largest pineapple plantations. •Hulope Bay is a marine preserve and considered one of the best diving spots in the world. •Once used as a target by the U.S. Navy and Air Force, the services are cleaning up unexploded shells. No one is allowed to go ashore without permission. The island consists of an uninhabited area of 45 square miles. “Big Island” is not the name of the island, but only a reference to it. “Hawaii” is the actual name, but people say “Big Island” as to not confuse the island’s name with the rest of the nation. •The Big Island is Hawaii’s largest at 4,038 square miles. It is twice the size of all other Hawaiian islands combined. •The largest contiguous ranch in the United States is in Hawaii. The Parker Ranch near Kamuela has about 480,000 acres of land. •At 800,000 years the Big Island is the youngest of the island chain. However, it was the first island discovered by voyaging Polynesians. •Kilauea Iki Volcano is the world’s most active and largest volcano. •Ka Lae is the southernmost point in the United States. It is located at 18:54:49 N, 155:41:00 W. There is a constant 27 knots per hour wind blowing East to West, 24 hours per day, and 365 days per year. •Two of the tallest mountains in the Pacific—Mauna Kea and Mauna Loa—dominate the center of the island. Most of the world’s macadamia nuts are grown on the island. •Mauna Kea is the tallest mountain in the world (measured from its base at the ocean floor). •The island houses the world’s biggest telescope and more scientific observatories in one place than anywhere else in the world. •The island is the worldwide leader in harvesting macadamia nuts and orchids.